Cables For Connecting Laptop To TV has various aspects to know. First is the purpose whether to watch TV on Laptop or output to TV and Second is the Cables. As the topic Cables For Connecting Laptop To TV has quite complex to the most basic users and historically we give warranty of cost saving yet easy and detailed explained technology behind, we will divide this article on Cables For Connecting Laptop To TV in few sub headers. Otherwise your heart might break with lot of false hopes which money making websites usually publishes with catchy titles and no actual information. If you are going to broadcast your Laptop’s screen to Television Screen just for the reason that it is bigger (or something else), you practically need very small things. Almost all laptops has cables for connecting laptop to TV for this purpose. There is no credit to write about it, today a 5 years old child can do it if he / she is shown it once. This is basically what those crap content websites publishes after doing a keyword research. If you are seeking a larger display for your laptop, use monitor, not TV. There are many reasons behind, there are differences between a TV and a monitor. That is why bigger monitors are sold (for example by Apple). But, most actually do not search for the above purpose, because one visitor has emailed us (this is the sole reason of writing this article on cables for connecting laptop to TV along with the keywords list, because he has a non technology related blog) – how to use the Set Top box with Laptop to watch the TV ? This is very reasonable and logical and practical question, because we will want to check the News Chanel while working. Most importantly, importing the video inside a computer somehow, means millions of possibilities. Unfortunately, except few specific models, most Laptops has no in built function to receive and display in some video player, you will need something more. Cables For Connecting Laptop To TV : How the heck My 3.5 inch cheap Media Player captures TV video then ? The technology to convert traditional broadcast media, including television is fully different. Their connectors, cables are designed for that purpose for optimal performance at minimum cost. Your Laptop can not by default play FM radio too, which your simple Java based mobile phone can do. This is an ugly choice, still first read our article on connectors. And then, how to connect a projector with Laptop running Windows 7. In your case, the TV is the projector. Apart from HDMI port, there is usual VGA port, that is VGA socket in your laptop. This needs the VGA plug to broadcast or extend the screen. If your reason for seeking the solution for Cables For Connecting Laptop To TV was this, then you got the answer. But for Audio, you have to use a compromised version – I have never seen a laptop with two red and white out standard audio port, this is called RCA Audio port. It has a headphone output, you have to use that with a converter cable that has one end for stereo input plug and other end has socket for standard red and white – RCA Audio Cable to Standard Stereo plug. This material is used for digitizing audio cassettes at cheap cost. There is only one practical way – using an External USB TV Tuner Box for Laptop. So basically Cables For Connecting Laptop To TV is becoming of many cables and two boxes. 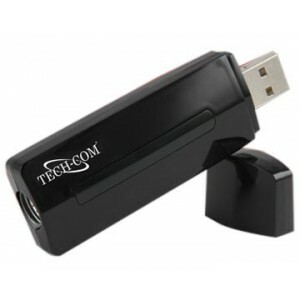 You can see a small portable such USB External USB TV Tuner Box for Laptop. ‘For Laptop’ is important point again. The last thing is an important dosage – it is nice that you are happy to read the article on Cables For Connecting Laptop To TV. But know it clearly – except the projectors, nothing is actually designed for a computer, they can blow your motherboard at any moment because of very minute voltage mismatch. We will suggest to stay 100 feet away from these odd ideas, no one will pay you if your laptop’s motherboard dies. For enterprise setup for bigger displays, first they use a dedicated computer for slide shows or videos plus they are actually monitor screens not TVs. 46″ – 80″ monitors are normally sold now. This Article Has Been Shared 2770 Times! Cite this article as: Abhishek Ghosh, "Cables For Connecting Laptop To TV," in The Customize Windows, October 21, 2012, April 24, 2019, https://thecustomizewindows.com/2012/10/cables-for-connecting-laptop-to-tv/.